What do you get when you mix the core mechanics of Angry Birds with that of Final Fantasy Tactics? If you said Angry Birds: Chocobo Edition, you would be close (and on to something so far as spinoff ideas go). Rather, you would have described in the simplest way possible what I believe to be the core essence of Squids Odyssey. Squids started life as an iOS title and eventually migrated to Android and PC by way of ports and spinoff titles. Squids Odyssey is the series’ first foray into the Nintendo Wii U’s eShop or consoles in general, which is impressive for a game about slingshotting cephalopods. 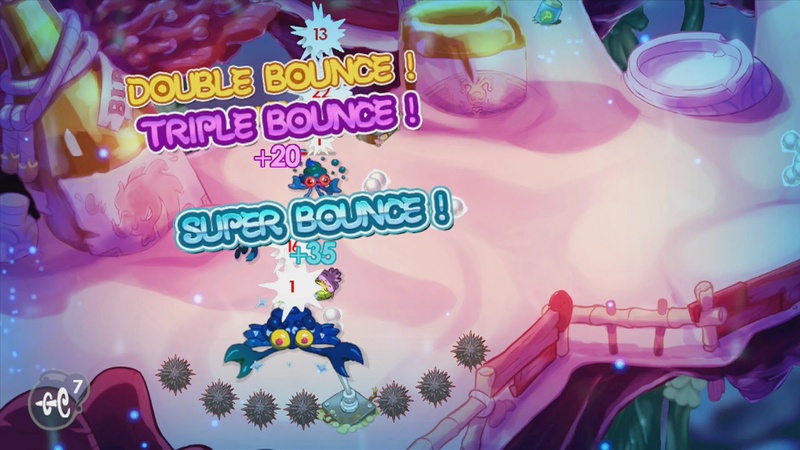 The issue with making the leap from mobile to console, such as with games like the aforementioned Angry Birds Trilogy, is that they aren’t necessarily built with the more attentive focus of the console space in mind. I mean, I’m perfectly content with doodling with a physics puzzle while sitting on the can for several minutes, but that doesn’t mean I’ll find the same joy in it when I sit down in front of my TV to play something. This is the one folly that Squids Odyssey brings to its Wii U iteration. The basic premise of Squids goes a little something like this: Steev and his tentacled companions are out treasure hunting before they are forced to contend with several assaults by other creatures of the sea. They learn that this is a result of a mysterious black ooze that is slowly polluting their waters. It also falls to them to raise an army large enough to fight back against this seemingly impossible foe, and thus their quest begins. It’s not an epic tale filled with political intrigue by any means, but it moves the game along and manages to be somewhat charming. And to that end it serves its purpose. The real draw is going to be the addictive gameplay that successfully fuses a rubberband physics exercise with strategy RPG sensibilities. For each stage, you can put together a party of squids from a selection of different classes. 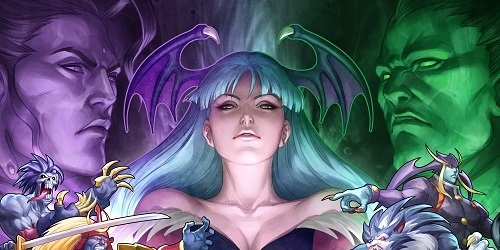 On their turn, each character has a meter indicating how much they can move as well as one showing their individual health. The idea is to propel yourself into the other enemies in such a way as to maximize damage. The Wii U gamepad works wonders as a control setup, particularly when using the touchscreen, as the game was designed with that scheme in mind. All you do is tap on your squid, slide your finger/stylus in the direction opposite of where you want to launch them to and let them fly. If you’re more of a button kind of person, using a combination of the analog stick and the A button accomplishes the same thing. The speed at which you connect coupled with the damage potential of your character will ultimately decide the damage done to your enemies. Sometimes, using your surroundings and various obstacles will lead to better results, as spiky urchins do lots of damage and falling into a pit will instantly eliminate someone (including you). 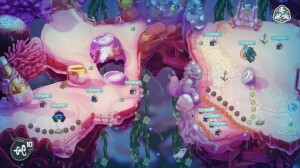 There are also streams and vortexes that will dictate movement long after a particular turn has ended, and much of the variety in the game is owed to the overall level design of each stage. The various classes come with their own innate abilities that, while minor, can really make things easier or harder depending on the combination you bring with you to a particular stage. Scouts, as expected, can cover the most ground as far as exploration is concerned. They can dash during movement to propel them even further than a normal launch would allow them to. 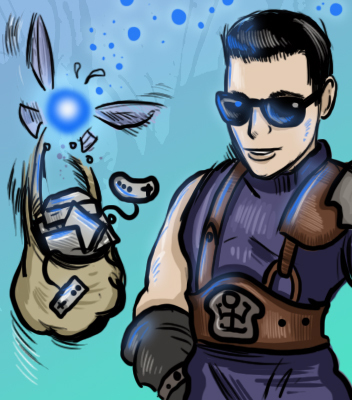 Shooters and Troopers are very similar in that they can damage enemies before or after their normal movement, with the former launching projectiles and the latter performing a stomp move that damages anyone within a close radius. Finally, you have your Healer class that restores health just by bumping into comrades. Each of your characters can be leveled up at your base between stages using pearls earned in battle. This is actually a nice system, since you don’t have to depend on a particular character scoring their own kills in order to be improved, something that has become problematic for healing classes in these sorts of games. The only trouble is, those same pearls are used to buy things at the store, so you really have to put some thought into your spending priorities. The store is where you can purchase new characters to unlock, items for use during battle, and stat-boosting helmets. Squids adopts a system where you can extract beneficial stats from helmets gained while still keeping the cosmetic appearance that you want. So worrying about appearance versus statistical gains is no longer an issue. Better yet, all characters within the same class can share in this benefit. A number of items that you can buy are incredibly useful as well, though they are expendable. The tentacles that revive knocked out squids in particular will find the most use during the trickier stages. 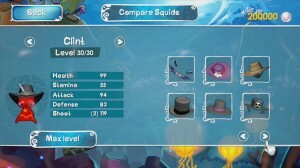 Squids Odyssey is very colorfully presented with unique looking characters and very vibrant backgrounds. It’s hard to imagine anything involving underwater creatures and scenery as being visually diverse and interesting, but The Game Bakers managed to cook up something appealing here. The 2D sprites and artwork are great whether viewed on the TV or the gamepad, and I didn’t notice any performance issues, which is always an impressive feat when it comes to ports. 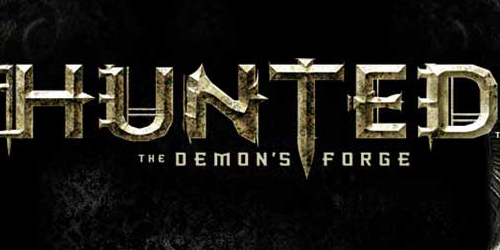 The audio is slightly less interesting, though the music and sound effects are at least inoffensive to the ears. If there was a downside to all of this, it would be that the game can only be enjoyed in short bursts. Unlike other games of this genre which have sweeping tales and combat situations that demand hours of your attention, Squids Odyssey is best digested into the small chunks its stage-based progression allows for. In fact, playing beyond that really causes the repetition to set in, especially as the game’s stages begin to hike up in difficulty. Its design definitely lends itself better to mobile play, which would make it a better fit for the 3DS of any Nintendo console (though my research seems to indicate that a 3DS version is coming). At least you are getting plenty of content, as the fifteen dollar price tag will net you nearly a hundred stages with numerous unlockables at your disposal. I know a lot of indie games with any sort of RPG tag attached to it is like playing Russian Roulette with potential RPG Maker drek, but in this case, Squids Odyssey is a quality offering. 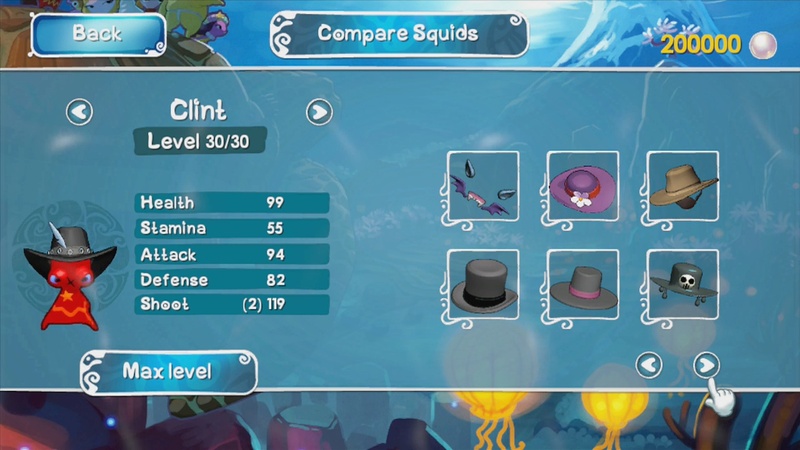 If you’re looking for a solid indie RPG for your Wii U, then Squids Odyssey has you covered. Its cutesy visuals disguise a deeper layer of addictive strategy gameplay that’s deceptively challenging, yet would be a good fit for gamers of all ages. Heck, it’d even be a good fit for genre newcomers. It combines the design philosophies of Angry Birds with that of tactical RPG’s while tweaking some of the more problematic aspects of the latter for an experience that’s far more accessible. Like most games that come from the mobile environment, however, the game can only be played in short bursts before repetition starts to set in; an aspect slightly curved by the ability to play without the presence of the TV. Still, considering the content you’re getting for the price, it’s worth taking a dip in the eShop ocean for.